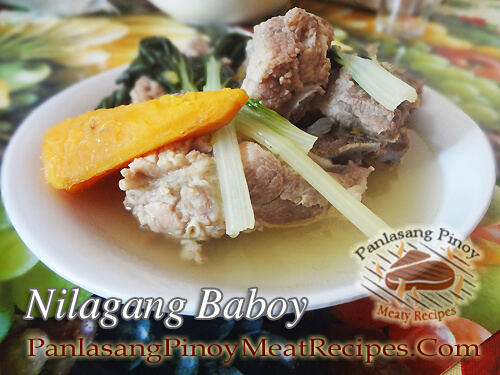 Nilagang baboy or boiled pork ribs or pork belly with vegetables is a very simple Filipino soup dish. The good thing about this dish is that you can substitute the vegetables cooked with the pork. For example, instead of potatoes, you can use sweet potatoes. In the absence of pechay, you can use bok choy. This dish very versatile and simple. And with regards to pork, choose pork ribs with thin layer of fat and remove the skin as much as possible. Because sometimes the skin has an unpleasant smelly swine odor specially male pigs. And you can actually taste that on the dish. We always remove the skin whenever we cook pork (except when frying like lechon kawali or crispy pata) but we keep it in fridge until there are plenty and enough to make pork rind cracklings or pork chicharon. Nilagang baboy or boiled pork ribs or pork belly with vegetables is a very simple Filipino soup dish. Remove the skin of the pork ribs or pork belly. Then slice it into ¾ inch thick and 1 and ½ to 2 inch length. Fill a medium size pot with water and let boil. Then put the pork and boil until the scum floats. Remove the scum that rises above the broth and add more water if needed. Add in the onion and black pepper then cook for an hour or until the meat is tender. Add in the sweet potatoes, salt and patis and cook for another 5 minutes. Then add cabbage and pechay and simmer for half a minute. Adjust the taste if necessary by adding more salt. I’m glad you like this recipe. Cheers!